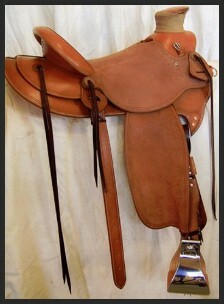 We make saddles using a variety of saddletrees that we build ourselves. 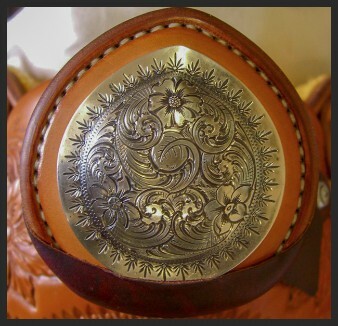 We make swell-fork, vintage and Wade saddles in the style and design of your choosing -- rough-out, half-breed, full floral, full-stamp. Your choices are nearly endless. ​​During the last dozen or so years our customers have chosen Wades and used them in all western disciplines. We ride Wades ourselves in our ranch and trail work. 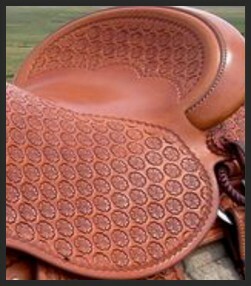 But while those saddles are very popular, they may not be the best fit for you. Here is a little history on the Wade and some details that may help decide you decide if a Wade is for you. The first Wade was built in 1937 at the Hamley saddlerly in Pendleton by a tree maker Walt Youngman for a customer named J.C. “Cliff” Wade of Enterprise Oregon. Supposedly, the Hamley catalogs of that period said this about the Hamley Wade: The bars on this tree have been fashioned from an old saddle brought across the plains by a customer’s father….” Youngman came up with a tree that had a five-inch horn and wider and thicker bars than other saddles of that time. The result was a saddle with a deep seat that sat low on the horse, giving it an advantage for a cowboy roping cattle on the open range. 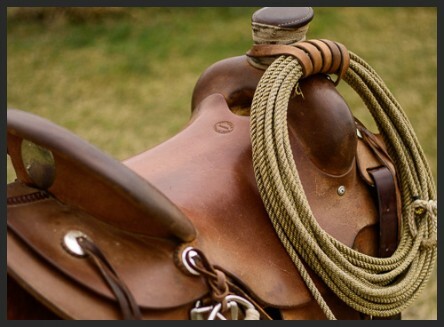 It was a saddle designed for hard work, and became popular among the buckaroo cowboys of the Northwest (northern California & Nevada, Oregon, Idaho, and western Montana) . 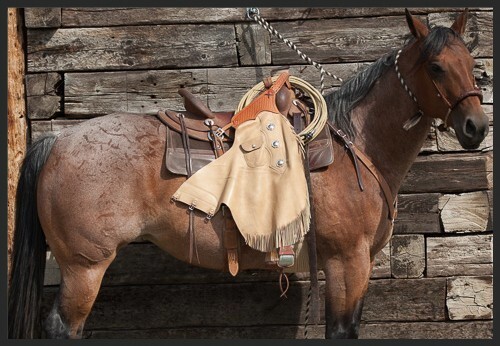 If you compare the Wade saddle (far left) to the 1870s saddle on display at the Grant/Kohrs Ranch in Deer Lodge, Montana, you can see Youngman made big changes in his saddle-tree. There is no way to know if this old-time saddle was the type referred to in the Hamley catalog but it is representative of saddles used by cowboys on the northern plains in the early days. If Ray Hunt had not traveled the country giving his natural training clinics, the Wade probably would still be in the Northwest. 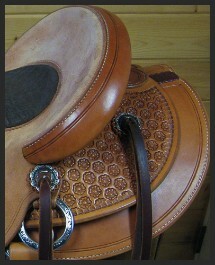 Ray Hunt used Wade saddles, and those who followed him in the clinic business used the saddle he used. And the people who attended the clinics started buying Wades, which has led to their popularity. 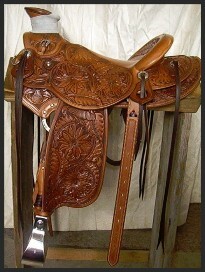 One misconception about the Wade is that it gives the rider closer contact to the horse than other tree styles. 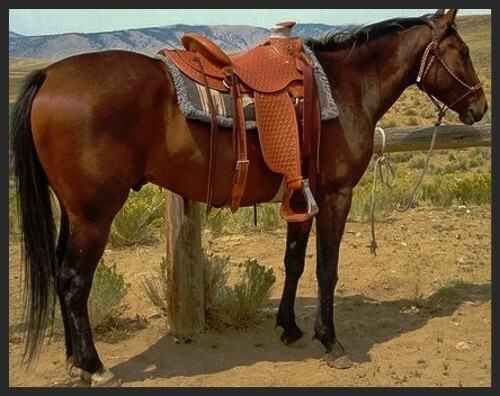 A swell-fork saddle can give you as much close contact as a Wade, perhaps even more, depending on how the saddle maker builds the ground seat. 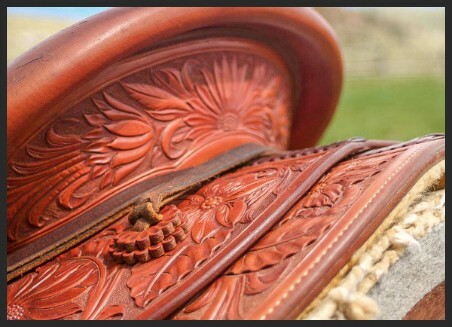 We were commissioned by the historic Grant/Kohrs Ranch, Deer Lodge, Mt., to build this saddle to replicate the old-style range saddles used by cowboys at the ranch in late 1880s. 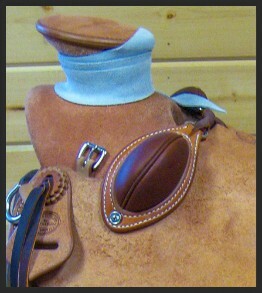 Saddle above is a Wade half-breed with clean border outline. 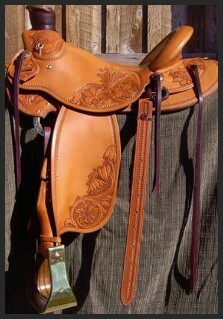 This is an all-around saddle and a variation of the saddle on the horse on the home page. 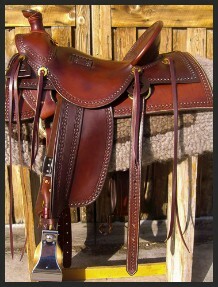 We built this saddle for clincian Byran Neubert. The in-skirt rigging gives the rider a good feel for the horse, plus it reduces weight. It's a strong rigging and can be used for roping.